Jack Irish is an Australian television drama series first broadcast on ABC1 on14 October 2012. The series stars Guy Pearce as the title character, a former criminal lawyer turned private investigator and debt collector. Much of the action is set in the Melbourne suburb of Fitzroy. Adapted from the detective novels by author Peter Temple, Jack Irish was created by Andrew Anastasios, Matt Cameron and Andrew Knight. It began life as three feature-length movies, before being adapted into an ongoing series, of which two six-episode blocks have been broadcast thus far. All three movies were directed by Jeffrey Walker, while Kieran Darcy-Smith serves as lead director on the series. Bad Debts, the first of the three feature-length movies, was watched by an average of 950,000 Australian viewers, ranking as the sixth most watched programme of the week. Black Tide, the second movie, was watched by an average of 851,000 Australian viewers, ranking as the thirteenth most watched programme of the week. Dead Point, the third and final movie, was watched by an average of 780,000 Australian viewers, ranking as the eleventh most watched programme of the week. The first series of six episodes broadcast from 11 February to 17 March 2016. The second series broadcast from 8 July to 12 August 2018. The second series was dedicated to the memory of Peter Temple, who died in March 2018. 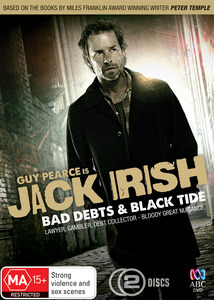 Guy Pearce as Jack Irish; a criminal lawyer turned debt collector and troubleshooter. Jack is still troubled over the murder of his wife by a deranged ex-client. He also works as an apprentice cabinet maker for Charlie Taub. Marta Dusseldorp as Linda Hillier; a determined reporter. She starts an on-off romantic relationship with Jack, becoming embroiled with many of Jack's investigations. Aaron Pedersen as Cam Delray; Tough, but kind hearted, Cam is Harry Strang's right-hand man and one of Jack's closest friends. Cam often uses his spare time to help Jack out in his cases. Roy Billing as Harry Strang; a big racing aficionado who often enlists the aid of Jack and Cam. Shane Jacobson as Barry Tregear; a gruff, overweight cop who reluctantly helps with Jack's investigations. Jack receives a call from ex-client Danny McKillop. Jack goes to help, only to discover that Danny is dead. Des Conners an old friend of the Irish family, comes to consult Jack over the disappearance of his son Gary. Jack is consulted by Justice Loder to recover a mysterious red book. Jack is back to debt collection and Linda takes a job in Manila. Still, Jack soon finds himself involved in some witch hunt that has to do with a massacre that happened in the Philippines years ago. Jack is still working with sculptor Sarah to find who killed her sister, and bodies start to accumulate. In the meantime, Linda is trying to get her bearings in Manila and is able to help Jack. Jack's investigation leads him to get close to a mega-church pastor, but Linda and her team fall in a trap when they explore an island that seems to be the base for criminals. A tense night in the Filipino jungle results in a chance discovery for Linda and Orton. Jack's concerned for Sarah's well-being as she becomes consumed by manic determination following news about Tina. Jack struggles to recuperate and his mind takes an increasingly turn towards Rob Shand. Back in Manila, Linda is abducted. Longmore refuses to act against the church leaving Jack alone to fight for Sarah. Jack is now on the run from both the police and members of Via Crucis. Terrified yet resolved, Linda finally comes face to face with her captor. The apparent suicide of a foreign student triggers a chain of events that sees Jack risking his life to uncover the truth. As Jack Irish investigates two deaths, he delves deeper into the murky world of international colleges. As Jack Irish discovers more about the deaths, he isn’t sure who he can trust. Secrets are revealed as Jack Irish's investigation stretches to the colourful streets of Mumbai. As Jack Irish gets closer to the truth, his investigation threatens to tear his world apart. Jack Irish fights to unmask the truth, but will this fight for justice be his last? ^ "Jack Irish". Thrillingdetective.com. Retrieved 14 October 2012. ^ "Jack Irish Credits" (PDF). Retrieved 19 March 2016. ^ "Guy Pearce To Star As Jack Irish In Two ABC1 Tele-Movies – ABC TV Blog". Blogs.abc.net.au. 8 August 2011. Retrieved 14 October 2012. ^ Knox, David (15 October 2012). "Sunday 14 October 2012". TV Tonight. Retrieved 5 October 2016. ^ Knox, David (22 October 2012). "Sunday 21 October 2012". TV Tonight. Retrieved 5 October 2016. ^ Knox, David (14 April 2014). "Sunday 13 April 2014". TV Tonight. Retrieved 5 October 2016. ^ "Free-to-air TV pick: Jack's back, but he'd rather just go to the pub". The Age. 7 July 2018. Retrieved 9 July 2018. ^ "Jack Irish season two review – cracker cast lights up classy cloak-and-dagger stuff". The Guardian. 8 July 2018. Retrieved 16 July 2018. ^ a b Knox, David (19 September 2012). "Airdate: Jack Irish". TV Tonight. Retrieved 24 October 2012. ^ a b c Knox, David (12 February 2012). "Thursday 11 February 2016". TV Tonight. Retrieved 5 October 2016. ^ a b c Knox, David (19 February 2012). "Thursday 18 February 2016". TV Tonight. Retrieved 5 October 2016. ^ a b c Knox, David (26 February 2012). "Thursday 25 February 2016". TV Tonight. Retrieved 5 October 2016. ^ a b c Knox, David (4 March 2012). "Thursday 3 March 2016". TV Tonight. Retrieved 5 October 2016. ^ a b c Knox, David (11 March 2012). "Thursday 10 March 2016". TV Tonight. Retrieved 5 October 2016. ^ a b c Knox, David (18 March 2012). "Thursday 17 March 2016". TV Tonight. Retrieved 5 October 2016. ^ Knox, David (9 July 2018). "Sunday 8 July 2018". TV Tonight. Retrieved 16 August 2018. ^ Knox, David (16 July 2018). "Sunday 15 July 2017". TV Tonight. Retrieved 16 August 2018. ^ Knox, David (23 July 2018). "Sunday 22 July 2018". TV Tonight. Retrieved 16 August 2018. ^ Knox, David (30 July 2018). "Sunday 29 July 2018". TV Tonight. Retrieved 16 August 2018. ^ Knox, David (6 August 2018). "Sunday 5 August 2018". TV Tonight. Retrieved 16 August 2018. ^ Knox, David (13 August 2018). "Sunday 12 August 2018". TV Tonight. Retrieved 16 August 2018. ^ a b Knox, David (20 February 2016). "Timeshifted: Thursday 11 February 2016". TV Tonight. Retrieved 6 October 2016. ^ a b Knox, David (1 March 2016). "Timeshifted: Thursday 18 February 2016". TV Tonight. Retrieved 6 October 2016. ^ a b Knox, David (7 March 2016). "Timeshifted: Thursday 25 February 2016". TV Tonight. Retrieved 6 October 2016. ^ a b Knox, David (16 March 2016). "Timeshifted: Thursday 3 March 2016". TV Tonight. Retrieved 6 October 2016. ^ a b Knox, David (21 March 2016). "Timeshifted: Thursday 10 March 2016". TV Tonight. Retrieved 6 October 2016. ^ a b Knox, David (30 March 2016). "Timeshifted: Thursday 17 March 2016". TV Tonight. Retrieved 6 October 2016.